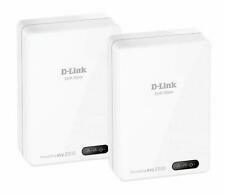 Plus, D-Link's PowerLine AV Network Adapter incorporate 128-bit AES encryption for securing your connection to help keep your data safe from intruders. Expand your wireless LAN by connecting an access point to achieve stronger wireless signals in remote areas. 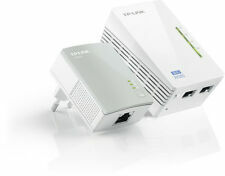 Kit de 2 CPL AV2000 - 2 ports Ethernet Gigabit avec prise gigogne. 2 ports Ethernet Gigabit pour offrir un accès internet à votre TV connectée, console de jeux, PC. TL-PA9020P KIT. INFORMATIONS D'EXPÉDITION. PowerLine AV2 1000 Gigabit Starter Kit. 1 Gigabit Port. Input power: 100V ~ 240V, 50/60 Hz. It's that simple! Simply plug and play. A simple push of a button will get your network secured in minutes. Create a high-speed network using your existing electrical wiring with D-Link’s DHP-701AV PowerLine AV2 2000 Gigabit Starter kit. This includes TWO adapters! Do More With MIMO Technology. Service, Support und Qualitätsversprechen! Die Gewährleistung beträgt 12 Monate! 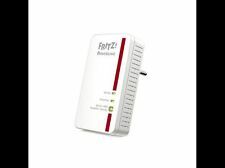 Mit TP-LINKs WLAN-Powerline-Adapter TL-WPA4220 erweitern Sie Ihre bestehende Ihre Internetverbindung in bisher nicht abgedeckte Bereiche. Devolo Cockpit is far more than just a status monitor for the powerline network: In its network display, the graphically appealing software shows the connection speed of all adapters in the network. The dLAN ® 1200 ac from devolo. This is from the very latest and fastest available Powerline gigabit generation. dLAN ® 1200 - faster and easier than ever before. 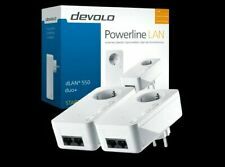 The latest Powerline generation - devolo dLAN ® 1200 . This will be plug and play if your Devolos are still at default settings. If you have any queries just ask, I usually am able to respond very quickly. Single unit EXCELLENT CONDITION WITH NEW CABLE. 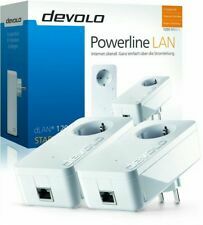 Die neue Powerline-Generation - devolo dLAN® 1200 . Damit bauen Sie ganz einfach das derzeit leistungsstärkste Heimnetz über die die Stromleitung: Verbinden Sie Ihre netzwerkfähigen Geräte mit bis zu 1200 Mbit/s für anspruchsvollste Datenübertragungen und blitzschnellen Internetzugriff. Begrüßen Sie die digitale Zukunft in Ihren vier Wänden! Wie das geht?. Mit dem devolo Magic 2 LAN und seinen zauberhaften Eigenschaften. Damit sind Sie heute schon für übermorgen bereit. Dabei erreicht devolo Magic 2 LAN unglaubliche Spitzengeschwindigkeiten von bis zu 2400 Mbit/s für die pure, digitale Freiheit. 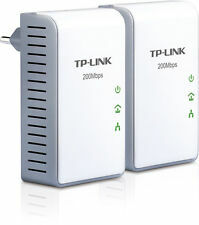 TP Link 2 x AV500 Wi-Fi (TL-WPA4220) & 2 x AV600 (TL-PA4010) Powerline Used condition. Ultra Low Loss LMR400 Compatible, RF Antenna Coax Cable with N Maleconnectors. UV Protected PE outer jacket. Compatible with the industry standard connectors and tools. Light Weight, Flexible Low Loss Cable. All mine are properly tested and reset if refurbished. I have not used this because it is new and sealed but did set others up for test purposes so can assist you if you wish. Ultra Low Loss LMR400 Compatible, RF Antenna Coax Cable with N Maleconnectors. UV Protected PE outer jacket. Ultra low loss characteristics ensure the maximum performance of your installation. Light Weight, Flexible Low Loss Cable. The PowerLine AV2 2000 Gigabit Network Extender Kit. Create a high-speed network using your existing electrical wiring with D-Link's DHP-701AV PowerLine AV2 2000 Gigabit Starter kit. 1 Gigabit Port. and then press the Simple Connect button to create a secure connection. Connecting the MoCA Adapters is a relatively simple process. To connect the first Adapter1. Connect the other end of the coaxial cable installed in step 1 to the Coax port on the side of the Adapter.3. Using your home`s existing electrical circuit, TP-LINK`s TL-PA8010P KIT AV1200 Gigabit Passthrough Powerline Starter Kit turns any electrical socket into an Internet connection. Simply plug into your wall socket and you are ready to enjoy HD streaming and gaming, no configuration required. You also won`t lose a socket with its integrated pass through socket included! With speeds of up to 1200Mbps for smooth Ultra HD streaming, online gaming or faster downloads, TL-PA8010P KIT is a perfect home entertainment companion.1200Mbps! Perfect for Bandwidth Demanding ActivitiesWith its advanced HomePlug AV2 technology, TL-PA8010P KIT is introducing a powerline generation for even faster data transmission... Click here for more details. 1x TP-LINK AV600 Powerlink TL-PA4010P. DORIS CCTV. UK CCTV SUPPLIER. CCTV EXPERTS. NEED CCTV HELP?. Up to 300m range over the existing household power circuit. Colour: White. Material: Plastic. TP-Link TL-PA8030P Kit AV1300. Die integrierte Frontsteckdose sorgt dafür, dass kein Steckplatz verloren geht. Die integrierte Frontsteckdose kann wie eine normale Steckdose verwendet werden. Der integrierte Rauschfilter reduziert die Anfälligkeit der Powerline-Übertragung für Interferenzen. 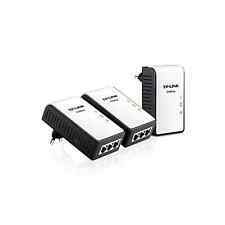 Serie 9326 DLAN 650 Starter KIT. Software supportato Mac OS X 10.8 Mountain Lion. Sistema operativo Ja. Fattore di forma Scheda di rete. Mr Beams™ brightest outdoor LED Battery-Powered Spotlight with motion and light sensors. Brightly light up warehouses, storage buildings, office parking lots, patios, decks, porches, yards, stairwells, hallways, garages, entrances & exits. An integrated power socket allows you to plug in a mains powered device. Using the free tpPLC app, you can access your network settings and manage them from your phone (Android, iOS). Gigabit powerline ac Wi-Fi kit (TL-WPA8630KIT). Aztech HL115EP 500mbps Homeplug AV Gigabit with AC Pass through. Plug in colour: White. Brand new in cellophane packaging. TP LINK TL-WPA9610KIT AV2000 GIGABIT POWERLINE AC WI-FI KIT. Plug, Pair and Play – allows setup of your powerline network in minutes, so you can enjoy fast, seamless wired and wireless connections right away. TP-Link TL-PA4020P KIT V1.20 AV600 2-Port Powerline Adapter with AC Pass Through. Condition is New. Dispatched with Royal Mail 1st Class. Mr Beams™ multipurpose LED Battery-Powered Stick Anywhere Night Lights with motion and light sensors. · Auto Shut Off: Mr Beams™ Stick Anywhere Night Lights turns off automatically after 30 seconds of no motion, conserving battery life. TP-LINK TL-PA9020 KIT AV2000 PowerLine. 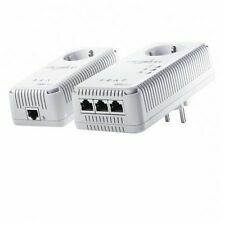 TP-Link TL-PA7020 AV1000 Powerline Kit PowerLAN. AVM Powerline 1220E - Einzeladapter für PowerLAN. Eingebauter Ethernet-Anschluss. Batterien dürfen nicht in den Hausmüll gegeben werden. Compatible with all AV2000, AV1200, AV1000, AV600, AV500 & AV200 powerline adapters. Take Your Powerline Network to the Next Level. With a lag-free connection, you will never miss out again. Simply by pushing the Pair button on the adapters, users can set up a hassle-free powerline network within minutes, complete with 128-bit AES encryption for network security and data protection. Using the free tpPLC app, you can access your network settings and manage them from your phone (Android, iOS). Product is genuine original from manufacturer authorized distributors. Plug, pair and play - set up your powerline network and start enjoying fast, seamless wired/wireless connection in minutes. 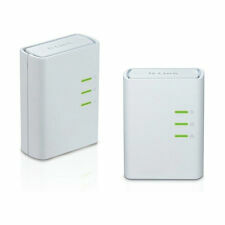 TP-Link TL-WPA4220KIT AV500 300Mbps Wireless Wi-Fi Powerline Range Extender Kit. New in sealed packaging, please review pictures and ask any questions before bidding, thanks! TP-LINKs TL-WPA4220 extends your Internet connection to every room of the house through your homes existing electrical circuitry. The TL-WPA4220 features a Wi-Fi Clone Button enabling Super Range Extension, which means it can automatically copy the SSID and Password of your router. In this way, TL-WPA4220 simplifies your Wi-Fi configuration and allows for seamless roaming within your home network.One Touch Super Range ExtensionWith a Wi-Fi Clone Button enabling Super Range Extension, the TL-WPA4220 can automatically copy the wireless network name (SSID) and Password of your router at the push of a button. After the pressing the button, you can place the powerline adapter anywhere you want wired... Click here for more details. AV600 Powerline Universal Wi-Fi Range Extender, 2 Ethernet Ports, Network Kit. Manage your powerline Wi-Fi through tpPLC app from your smartphone (Android, iOS), or download new tpPLC Utility on PCs to manage the powerline network. These were also sold in twos as model 9131 or 9138 for a network kit of three. I am usually able to respond very quickly. Mit dem dLAN® 550 WiFi Adapter surfen Sie endlich unbegrenzt im ganzen Haus. Verwalten Sie kinderleicht Ihr persönliches Heimnetzwerk mit der intuitiv zu bedienenden und kostenlosen my devolo App für Apple iOS und Android. Votre réseau à domicile venant de la prise de courant murale. Ultra Low Loss LMR600 Compatible, RF Antenna Coax Cable. Light Weight, Low Loss Cable. RG Type Cable. Compatible with the industry standard connectors and tools. Attenuation (20 °C, dB/100 ft). DC Resistance (Centre Conductor)/km. Also, it features two pass-through sockets, so you can use the socket as usual. It also uses power-saving technology to conserve up to 85% energy when not in use. Maximum Powerline Speed AV1200 AV1300 AV1200 AV2000 AV2000. Brightly light up patios, decks, porches, yards, stairwells, hallways, garages, entrances/exits. · Auto Shut Off: Mr Beams™ Spotlight turns off automatically after 30 seconds of no motion, conserving battery life.